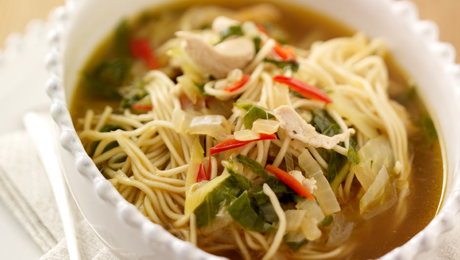 A tasty and simple homemade chicken noodle soup, just perfect for those Winter months! Add the chicken and stirring gently allow to cook for a minute or two. Add the hot chicken stock and soy sauce and bring to the boil and then add the noodles. Reduce the heat slightly and leave to cook for 5 minutes until the noodles are softened. Before serving check the seasoning, add the chopped coriander, stir and serve.